Somewhere between clean and ship-shape and rugged industrial lives a look that’s equal parts contemporary, charming and ever-so rustic. For many of us torn between styles, the modern farmhouse look is a sure thing—no converted barn required. Industrial loft, meet country kitchen. Rough and unfinished, meet clean lines and structure. Heirloom, meet contemporary. By name alone, the modern farmhouse look is a blend of beloved styles. It’s a bit restoration and a bit rustic, while maintaining the tenets of today’s definition of modern style. Restoration style picked up steam in the early 1980s when people began purchasing older homes and revitalizing them, but didn’t want to put in contemporary fittings that clashed with the historical style of their architecture. Modern farmhouse certainly pulls from this idea of mixing eras of design, in a way that’s at once soft, polished and easy on the eyes. Here are six ways you can bring the modern farmhouse look into your home. You can make your modern farmhouse look all about metals, or you can inject some color in just the right tones. Borrowing from a Scandinavian style of subtle hues, a soft pink or sage-y green might be just the thing to juice up an otherwise more neutral design. Leave it at that, or further play off the color boost by bringing in matching utensils, cookware or wall art to bring more color cohesion, if you’d like. 2. Bring an outdoor vibe in. From light fixtures to furniture, many outdoor-intended designs actually incorporate a nice outdoorsy element when brought indoors. Industrial-style lights, worn wood and cool metals are favorites of rustic outdoor spaces, but there’s no reason they can’t be at home in a kitchen or living space. Outdoor lighting and furniture is also often a bit large in scale, so bringing that design bounty inside is an easy way to make a statement in a room. 3. Push for pulley style. 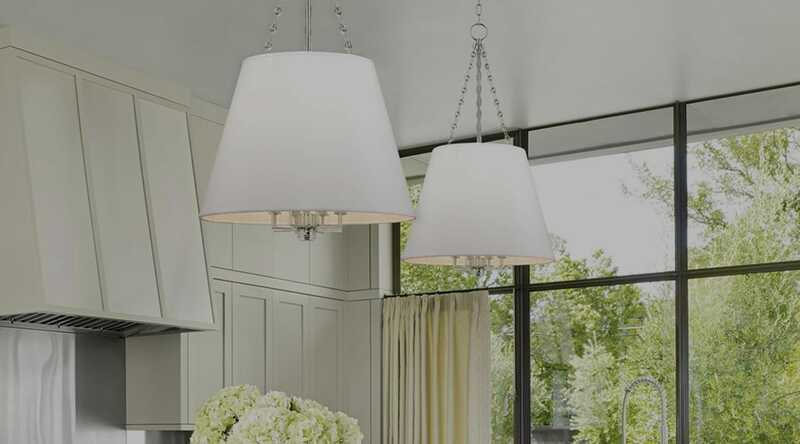 Pulley style lights are weighted or adjustable fixtures with an old-timey function to adjust the placement of the light. Their distinctly historical look nicely showcases a sense of farmhouse style, and using them in a kitchen is a great solution for adjusting downlight over a kitchen island or counter. The design is visually pleasing, and the functionality goes a long way. We’re not looking for the rough-hewn splinter kind of effect here. But a more finished, smooth wood finish warms up a space and creates an instant farmhouse feel. To keep it more modern than rustic, look for handcrafted specialty pieces free of glaring imperfections or stains. Wood adds a great accent for mirrors, small accessories or even a table or chair. Soften any hard edges with pillows, throws and soft lighting. 5. Matte Black is back. Reminiscent of a chalkboard, matte black finishes recall the one-room country school house, but that doesn't mean its place is in the past. Matte black finishes have an old-school vibe (the opposite of being shiny and new) while maintaining a modern monochrome look that is a welcome update to farmhouse style. Neutral textiles add a hand-hewn softness and keep a modern farmhouse from leaning too rustic. Sticking to an airy palette is fresh, effortless and always chic. Rather than going for stark whites or strong colors, use texture-heavy, creamy hues instead. A patch of rug can help link a mixture of antique and modern furniture pieces together in a room, while cushions soften the hard lines of more modern pieces. Have a modern farmhouse look you want to share? Use #loveyourlumens on Instagram to show us your space.